All three "M. H. Cole" versions of this scabbard are available to order; other known variants can also be supplied. The "M.H. Cole - Type 1" - has metal plates, throat staples & lacing eyelet. The "M.H. Cole - Type 2" - has no metal plates, but does have the throat staples & lacing eyelet. The "M.H. Cole - Type 3" - has metal plates, but no throat staples & no lacing eyelet. Other versions aside from those shown in the M.H. Cole books are also available. citing which reference book/source, page numbers, etc. Based on the British issue Fairbairn Sykes commando dagger, the United States Marine Corps adopted a similar knife for their "Marine Raider" & "Paramarine" units. but a zinc handle that was cast as a single piece (& proved to be brittle under some field use). and quite a variety of taper angles to the lower part of the scabbard body from almost parallel like the original M6, to almost pointed. or more correctly, the U.S.S. Omaha. 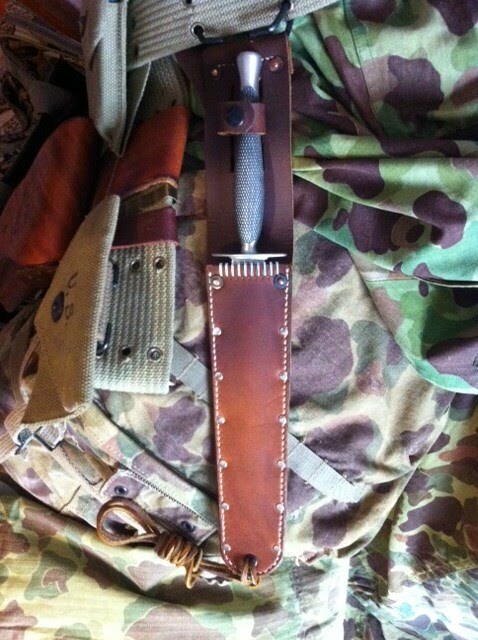 This scabbard was to take a batch of issued V-42 knives. I am also offering the U.S.S. Omaha V-42 scabbards too. I can supply these scabbards as well. The photograph below shows my FIRST production Raider Scabbard...a "Type 2"
Photo sent from the USA by it's very delighted owner! Copper hose rivets are used for the main reinforcement areas, with smaller chromed rivets elsewhere. Shown in the page header, second photo.